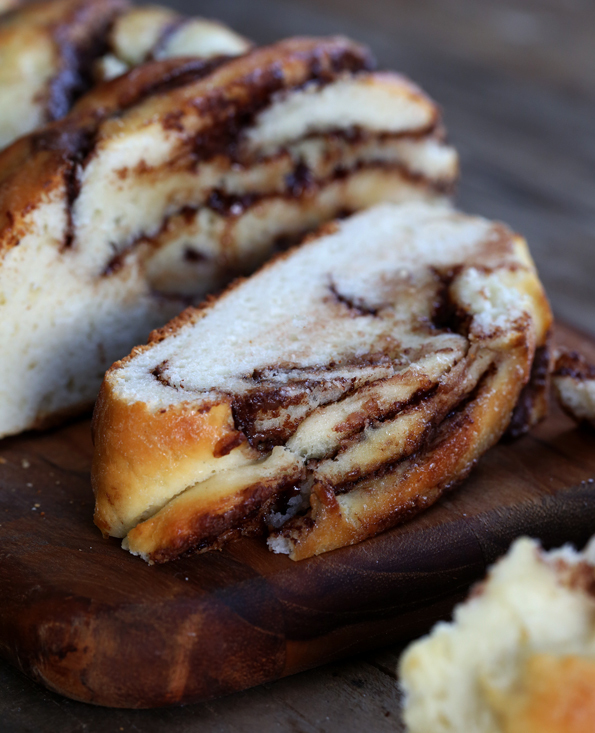 Warm and gooey gluten free Nutella bread, filled with everyone’s favorite hazelnut spread. Braided for a gorgeous presentation, it’s dressed to impress! 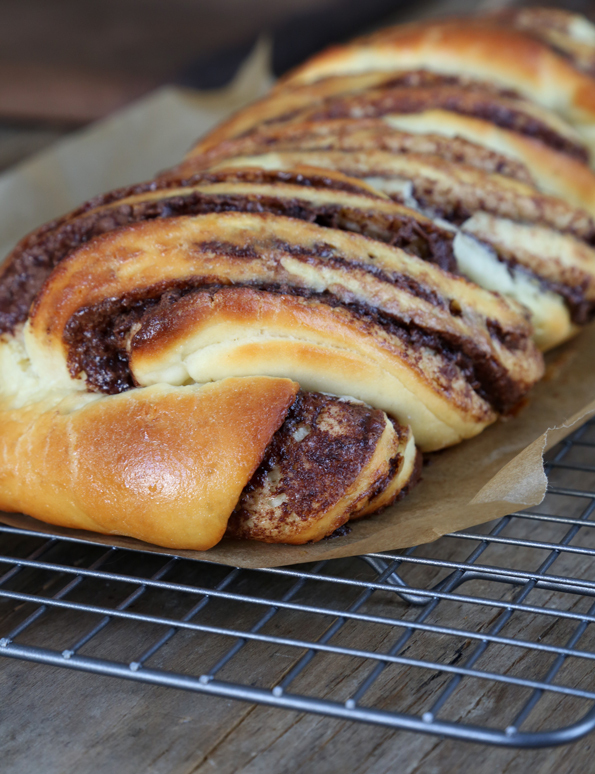 This gorgeous braided gluten free Nutella bread is a true delight for the senses. And since I imagine you’re wondering, yes. Nutella is gluten free. Making this fancy-looking yeast bread, though, isn’t actually any harder than making gluten free pinwheel cookies, for example. If you can roll dough into a cylinder, you can make this bread. The main difference in method (other than a yeasted bread rise, of course!) is that, once the dough is rolled into a cylinder, it’s sliced in half right down the middle. Working with cold dough will make that a snap. I have to confess that I’m not even the type to ever eat (or even think of eating) Nutella right from a spoon or anything. I’m not above it, but I just don’t crave it. Even so, this lightly sweet, tender bread, twirled around and around to create perfectly thin layers of Nutella, made a believer out of me. It’s not even a true “braid.” If you’re concerned that you aren’t great at braiding a small girl’s hair, you can’t make this bread, worry not! I can’t do anything other than a simple braid, and this braid is more of a twist. There are only 3 grams of instant yeast (1 teaspoon) in the whole loaf. And the final rise is really more of a swelling, and not a doubling rise. We don’t want the dough to rise high high high and lose its shape. Think of this more like a Danish than a loaf of bread. **Note: If you prefer, you may make and use this dough on the same day. It will not be as easy to handle, however, but you can work with it. To use the dough the same day it is made, after making the dough, set the covered dough to rise in a warm, draft-free environment to allow it to rise to double its size (about 1 hour). Once it has doubled, place it in the refrigerator for at least 15 minutes or until it is chilled. This will make it much easier to handle. Then, continue with the rest of the recipe instructions. Preparing the dough for shaping. On baking day, line a small rimmed baking sheet with unbleached parchment paper, and set it aside. Turn out the chilled dough onto a lightly floured surface and, using the scrape and fold kneading method and using a very light touch, sprinkle the dough with more flour and knead it lightly, sprinkling with flour when necessary to prevent it from sticking, scrape the dough off the floured surface with a floured bench scraper, then fold it over on itself. Repeat scraping and folding until the dough has become smoother. Do not overwork the dough or you will incorporate too much flour and it will not rise properly. Rolling out and filling the dough. On a lightly floured surface, roll out the dough into a rectangle about 1/4-inch thick, and 12-inches high x 15-inches wide, sprinkling very lightly with more bread flour as necessary to prevent sticking. As you work, shift and move the dough frequently, as shown in my pizza shaping video. Before the dough is fully shaped, transfer it to lightly greased piece of unbleached parchment paper. You will use the parchment paper to help roll the dough into a cylinder. Dust off any excess flour from the surface of the rectangle facing up (this will help the Nutella adhere to the dough), and spread the warmed Nutella in an even layer on the dough, leaving a 3/4-inch border clean around the perimeter. Beginning at a 15-inch side of the dough, and using the parchment paper to assist you, roll the filled dough tightly into a cylinder, like a jelly roll, ending with the seam side down. Cover the dough loosely with plastic wrap, and place in the refrigerator to chill for about 10 minutes. This will make the final shaping infinitely easier. Final shaping and rise. Once the dough has finished chilling, remove it from the refrigerator and uncover it. With a very sharp knife or pizza wheel, beginning about 1-inch from one end of the roll of dough, slice along the length of the dough all the way through to the end. You will have 2 strands of layered dough. Beginning at the intact end, twist each strand gently so that the cut sides of the dough are facing up. Braid the strands gently but securely back and forth over one another until you reach the end. You should have 4 or 5 twists before you reach the end. Cinch the open ends together and tuck them under the bread slightly. Transfer the dough to the prepared baking sheet. Place one hand on each end of the braid, and press the ends gently toward one another to create a slightly wider, shorter braid. This will help the braid rise together and adhere to create a nice loaf. Cover the baking sheet with a piece of oiled plastic wrap, and place in warm, draft-free location to rise only until just beginning to swell (about 20 minutes, but it could be more if your rising environment is particularly cold and/or dry). Do not overproof. Bake. As the dough is in its final rise, preheat your oven to 375°F. Once the dough has finished rising, uncover it, brush the surface evenly with the egg wash, and place in the center of the preheated oven. Bake for 10 minutes, and turn the oven temperature down to 350°F. Continue to bake until the dough is golden brown all over (about 15 minutes more). If you would like the Nutella to remain a bit gooey, remove from the oven when the dough is brown on top, but still gives very slightly when pressed on top. Otherwise, bake until the top is firmer to the touch (about 5 additional minutes). Remove from the oven, and allow to cool on the baking sheet for 10 minutes before transferring to a wire rack to finish cooling. Slice and serve when still slightly warm. Adapted from the recipe for Cinnamon Rolls on page 166 of Gluten-Free on a Shoestring Bakes Bread. 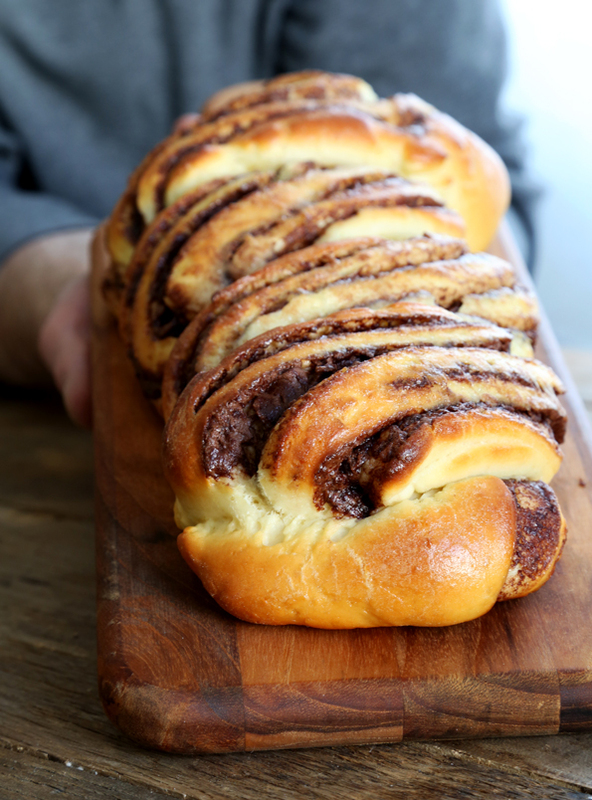 Braided Nutella bread concept and food styling inspiration from Inspired By Charm, as selected by YOU from my Must Make Gluten Free Pinterest Board. P.S. Do you have your copy of Gluten Free on a Shoestring Bakes Bread? Thank you thank you thank you for playing such an important part in this, the Gluten Free Bread Revolution! I can’t wait to get some Ultrex3 so I can try to make this. Everything in your Bread book sounds so yummy. For those who can’t eat boughten nutella, I pinned a recipe for homemade nutella that is gluten free, casein/dairy free, and soy free. I made it once and will have to locate the pin so I can make it again. So do a search for a homemade nutella that is safe for you to use. Thanks Nicole, your books are so good. Looks amazing! Question: I am new to GF cooking, I have Namaste Foods brand GF Perfect Flour Blend, which I presume is NOT the same as bread flour, or is it? Would I need to add anything to this blend to make it “bread flour”? Andrea, please read the recipe ingredients. How to build bread flour is described fully there. You cannot use Namaste flour blend to build the bread flour. I am allergic to wheat, corn, milk, soy and yeast. I have your book and am drooling. Doesn’t xanthan gum derive from corn? Can I use guar gum instead?Can I use gluten free baking powder instead of yeast? Can I use rice milk? Any suggestions will be appreciated. Can xylitol be substituted for the sugar? I just got this out of the oven. I made it dairy-free and used Doves Farm gluten-free brown bread flour (I am in the UK) and left if for an hour and a half to proove. I can’t wait overnight! It is rather messier than yours but as a first attempt at anything like this I am impressed! The picture is taken on my phone camera so doesn’t do it justice…but at the moment all I have since my camera broke! Thank you! I can’t wait for you to make it, Nicole! Hi Nicole, can I use plain GF flour? Valerie, no you cannot. You must make the recipe as written for it to work. I am sitting here waiting for the delivery of my whey protein isolate from Amazon. It is supposed to come today. I got my Expandex already. I just purchased the Kindle version of your book and I can’t wait to try your recipes. PB with melted, homemade chocolate would be delicious! Thank you so much for the idea. I am going to try it! Sounds like a plan, Julia! Do you have any ideas about replacing the Nutella with a healthier substitute? I am gluten sensitive and highly sensitive to MSG and other toxic chemicals. There are A LOT of chemicals and MSG in Nutella (AKA – skim milk, whey, natural flavors, vanillin). But this bread looks so good! It would be awesome to be able to make it with all healthy ingredients. Thanks! I can’t have dairy and was thinking about a substitute for Nutella myself. I would aim for replicating the texture and sweetness. My thought was possibly some Justin’s almond-chocolate butter thinned out a bit. Or some natural PB (which is generally fairly runny) mixed with some melted chocolate? I was wondering about a Nutella replacement also, but this is because 1. I really dislike the taste of Nutella and 2. It is made from hazelnuts and one of my children has a nut allergy. The bread looks so good and I really want to try it but can’t as written (and I’m not one of those that can look in my pantry and magically find a substitute…and I am secretly jealous of those who can. ha ha ha). There is a chocolate Tahini spread with Greek honey that I have been wanting to try as a replacement for the Nutella in many of Nicole’s recipes, (since we are dairy free also). Since it is a bit pricey I have not broken down yet, but this bread may have pushed me over the edge! It is found in the “ethnic” or world food aisle in my local grocery store(Meijer). I think it would have a similar creamy, rich, chocolatey taste. That spread sounds really interesting, Sherry. Can you please please please look into adapting English-style scones? My husband is from Britain, and he doesn’t recognize the triangle shaped sweet thing as a scone. My experience is that English scones (other than the shape, which you can easily cure with any recipe!) have egg, where the American ones do not. Otherwise, it’s not too different. American scones are not very sweet (at least I don’t make them very sweet!). Thank you! I made the berry scones from the first cook book, and added two eggs with the milk and they were perfect! English scones contain no eggs (unless you choose to glaze them with egg wash rather than just milk). Just plain flour, a pinch of salt, bicarbonate of soda, cream of tartar, butter, and milk. Extremely simple. I don’t know what is in an American scone, but being English, and brought up by a mother whose family have been professional craft bakers for more than 100 years, this is definitely what goes into an English scone. 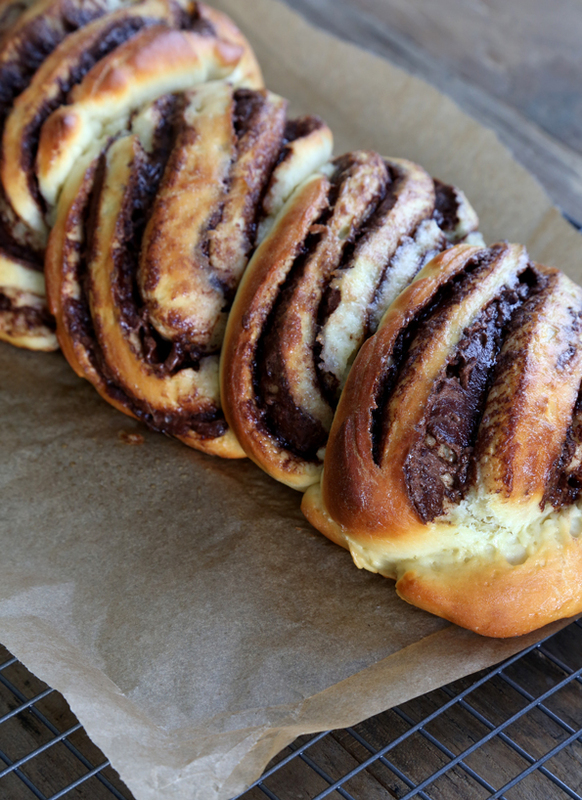 Just wanted to add that the Nutella bread looks great and I will be trying it tomorrow due to a request from my daughter…. Wow! This looks fantastic…I can’t wait to try it I especially am impressed with the shaping technique…what a nice presentation!I wasn’t able to purchase Expandex (I’m in Canada) so I have ordered the Ultratex 3 and will be baking up a storm as soon as it arrives! I did some baking to take to an agility trial yesterday….cream puffs (made them ahead and froze them, so they were ready for sampling as soon as we got there) and apple fritters. They were a hit! Next on my list is the Lemon Poppyseed Cookies. You have no idea how much I’m enjoying your books (yes I have’em all) and this blog…..You are my HERO! Thanks Nicole! You, my friend, have out done yourself!! Congrats!!! It may take me a while to work up to this one. as a side note, I used the dry ingredients from your better batter devil’s food cake to copy cat a “nothing bundt cake” bundt cake for a party this weekend – it got very good reviews from the ladies, kids, and ME! :) thanks for all you do! Yeah I will be making this like today. I was just fawning over the gluten filled version of it allover the internet. Well we can’t have that, Kristy. If there is fawning on your part, there should be gluten-free recipe-development on mine! wow! Can’t wait to try this!! I made the buttermilk biscuits from the book last night and they are amazing! I must remember to always make two batches, because one is never enough! Do I just do a straight double or triple the recipe for the bread flour if using Ultratex 3? I’m not sure I understand your question, Tracey. Do you mean, since the recipe for bread flour using Ultratex 3 that I have on the Resources page is for 1 cup, do you multiply it by 3 to get 3 cups? If that is your question, the answer is yes! While it looks wonderful, I am curious as to why you would go to the trouble of making a bread that is supposed to be healthier for those that have gluten allergies and then make it with a products that aren’t Organic? Perhaps there is a way to substitute something for the Nutella and using Organic gluten free flour?? Janie, it isn’t meant to be “healthier,” except to the extent that people who can’t eat gluten for health reasons can eat this without becoming sick from gluten. This is not a “healthy” blog, as gluten free food is not healthier, per se, for people who don’t need to be gluten free. I don’t follow this blog because I am interested in being “healthier” or “organic.” I follow this blog because Nicole has made it possible for my daughter to eat exactly the same types of delicious desserts and breads that her non-celiac siblings can eat, just without the gluten. She just wants to feel normal. Nicole has made that possible, and we are very grateful! “Organic” also does not equal healthy. Excellent work, Brian H. He’s a natural. I knew you’d love the Brian references, Donia!